UPDATE: Beacon Theatre Amex presale starts Thursday, Feb 10 at 12PM (Buy Tickets). 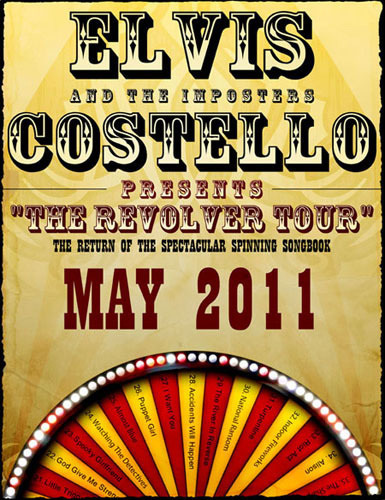 Though I was somewhat expecting a full on National Ransom tour with the Sugarcanes, I was more than pleased to hear that Elvis Costello has opted to bring back the Imposters for “The Revolver Tour” in 2011 (perhaps a nod to his favorite Beatles album). The Revolver Tour will be complete with the “Spectacular Spinning Songbook” wherein audience members will get to spin a giant 40 song wheel to determine the order of the evening’s setlist. Elvis last used the Spinning Songbook in 1986 during the Costello Sings Again/Blood and Chocolate tour. For the first time in 25 years, Elvis will let his set-list be chosen by ”The Spectacular Spinning Songbook”, a monumental game-show wheel that features 40 song-titles, including hits, rarities and very unexpected covers. The Tour will start in Reno, NV on May 7th and will wrap up in New York, NY on May 23rd. Presales for the Wellmont Theatre show and many other tour dates begin on Tuesday, February 8 at 12:00 pm EST via Arist Arena. As always, the username is elvis, password is costello. Presale details and general on sale dates for the Beacon Theatre shows (May 22 and 23) have yet to be announced. More Elvis Costello tour dates after the jump.